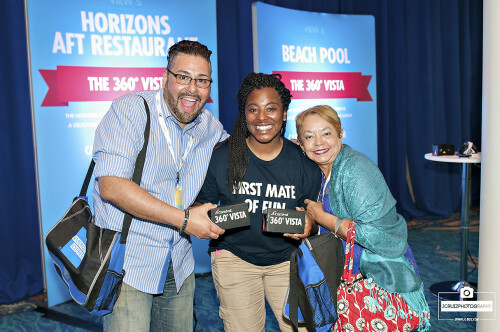 I was recently hired by Carnival Cruise Line to photograph them at a travel agent focused convention called CLIA cruise3sixty at the Broward Convention Center. 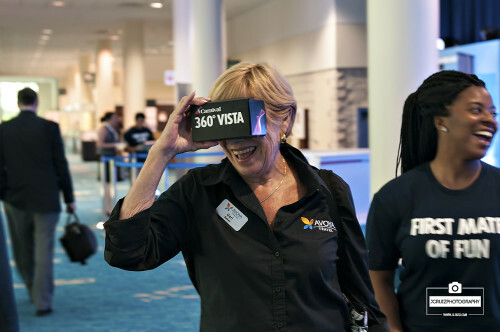 I was there to photograph the displays and staff as well as photograph the travel agents interactions with all the Carnival Cruise Line displays, especially the displays for their new ship, the Vista. I shot for Carnival for two days. 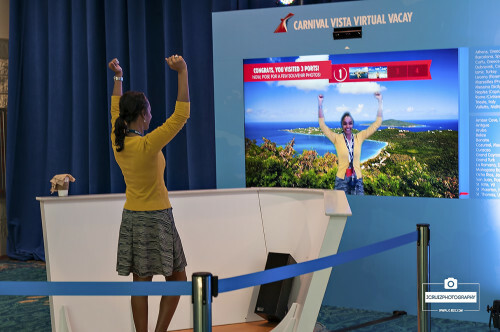 One day I was out by their Carnival Vista display where travel agents could get a 360 view of the new ship by placing this viewer up to their eyes and moving around in a circle. There were a few times were the travel agents got dizzy, which was funny until I looked into a viewer and could understand how they got dizzy. 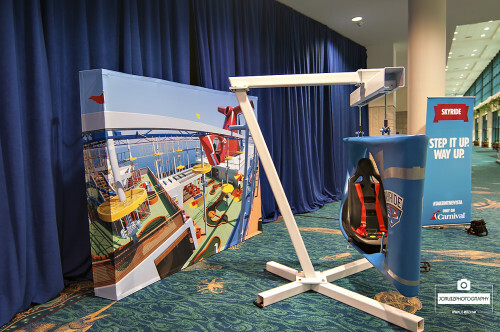 Carnival also brought out this interactive video game where travel agents had to race around ports and they had to see who could visit the most ports. This was the big attention grabber for travel agents as this game had a huge crowd around it for most of the day. I was lucky to get there when I did as the crowds were just starting to trickle out for the seminars and presentations that were going on. On the second day I photographed their presentation which featured Dr.Seuss and its characters as they are on the Carnival cruise ships as a featured entertainment. Afterwards I photographed the Carnival sales team and their executive leaders as well as their booth on the main convention floor. It was a pretty straight forward event photography shoot. The ambient light was plentiful which was always good and I had more than enough room to maneuver around displays and travel agents to get the required shots. 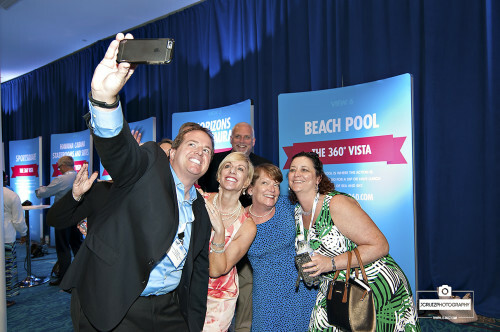 I was impressed by the sheer number of companies that encompass the cruising industry. Every major cruise line was there as well as smaller cruise lines and companies that supply the cruise ships with their products etc. It was pretty cool to learn about the cruising industry while I was there. 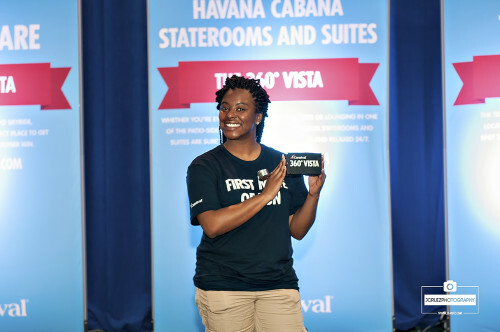 Overall it was a great experience and a fun time photographing for Carnival Cruise Line. I wouldn’t mind a free cruise to the Caribbean if they offered me one. 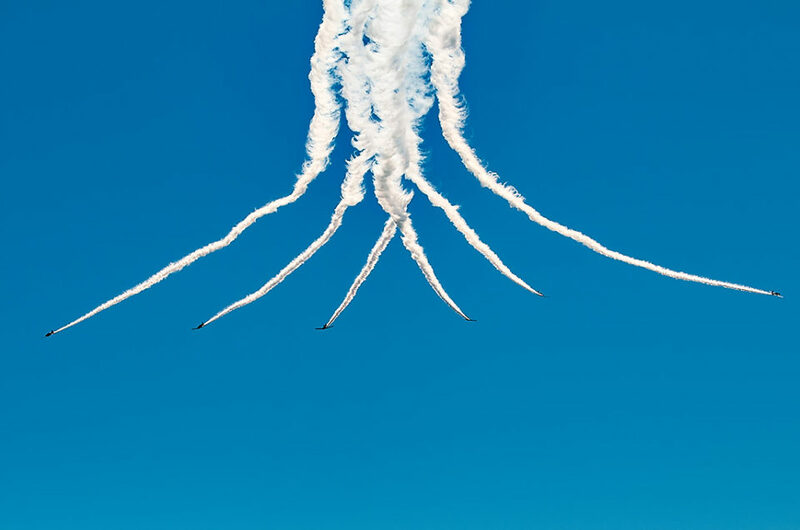 To be honest I wouldn’t mind hanging out of a helicopter photographing their ship out in the open sea or even in port. Perhaps next time. JC Ruiz is a Miami based photographer that specializes in portrait, fashion, engagement, and sports photography with a love for landscape and black and white photography.